Glass makes a perfect material for shower doors and walls in shower remodeling as it transmits sun light, stops the shower from feeling like a cave and allows the overall room to look more open and enlarged. Some door and wall assemblies have relatively thick frames that can house the panel. Doors, however, can be hinged directly to the wall without a frame, and when used in tandem with unframed glass panels, the effect on the room is entirely different. If you live in Long Beach, CA and are considering a glass door, remember that whatever is on the other side, from colorful mosaic tiles and beautiful outdoor views to toiletries and soap scum that needs cleaning, will be on display for all to see. 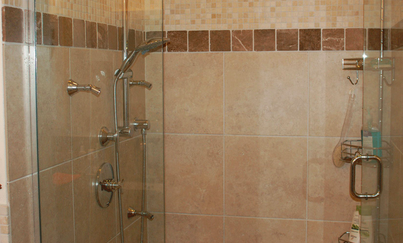 With over 30 years of shower renovations in homes in the Long Beach area, we can help with any projects you may have in mind. More shower info: It's easy to think of a shower is nothing more than a box with a glass door or shower curtains separating it from the rest of the bathroom. And many showers are exactly that. We have found much more interesting ways to integrate showers into an overall bathroom design, using glassblock, sheets of glass and even in absence of wall to find a space set aside for showering. Call us today for all your remodeling needs in Long Beach, CA!